True Star Foundation does more than offer a safe haven after school – it engages youth in every aspect of the business. True Star gives student staffers the training required to perform in today’s competitive job market, an opportunity to learn new skills, improve grades, develop mentorships with caring adults, and prepare for higher education and successful career paths. Mentoring gives teens an opportunity to create one-on-one relationships with industry professionals and their networks. The teens receive coaching and guidance from the instructors who lead the programs that go beyond just telling them what success looks like, but by showing them through the real life experience of creating and producing work for a media company. The instructor/student relationship has a positive affect on grades, moods and the tendency to take risks. Professional Development and Job Readiness teaches teens essential job and life skills. Students are taught about the standard tools and equipment of different professions, the importance of creating and meeting deadlines, and effective forms of business communication. In addition to teens receiving specific skills through the multi-media departments, they also participate in resume writing and interviewing workshops. Arts, Culture and Media give teens a voice in an arena where they are typically taught to be silent. Students who are socially, economically and ethnically diverse are able to express themselves and face the challenges of the world around them through written and visual art. Entrepreneurship affords teens the opportunity to develop inspiration for being a business owner in the future. Being part of a youth operated media company that values students’ feedback, implements their ideas and lets them see themselves in leadership roles, gives teens hope, dreams and independence. Youth employment provides a lot more than a paycheck. It provides some financial relief to youth and families, but it also gives young people a boost in self-confidence, an appreciation for the value of education, teaches the importance of work, and a belief that you can be something. 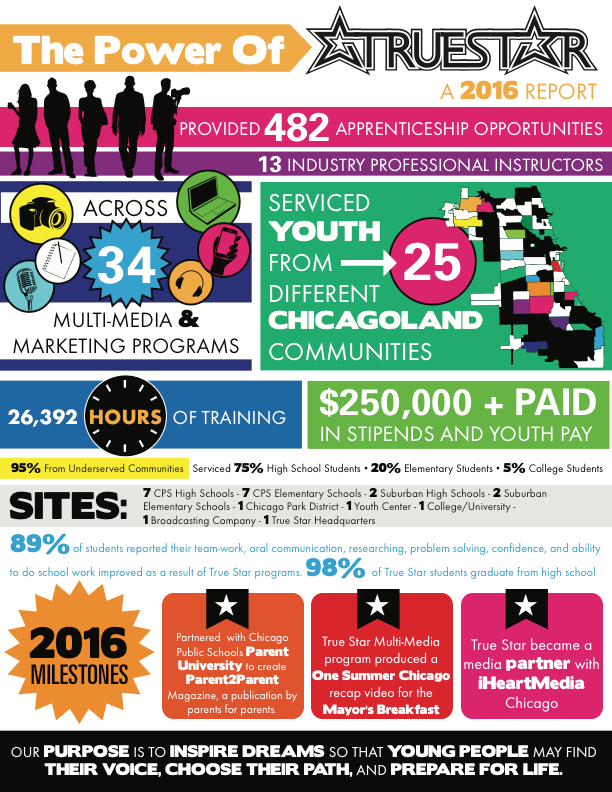 True Star has employed over 5,000 young people through its programs. With each youth that is employed, True Star impacts a family, a community, and impart habits that influence young people throughout their lives. True Star Media is changing the inequalities that exist within media learning and education, that affluent youth are likely to be “content creators” while disadvantaged youth tend to be “content consumers”. There is a tremendous need for youth in urban communities to have the same access and interaction with media technology tools as their more affluent counterparts. The new divide is not solely defined by access but interaction. This program increases involvement and exploration within the multi-media field, as youth in True Star gain a new curiosity for the world. True Star develops competence and confidence, by getting youth to envision themselves as viable contributors and participants in the world of media, business, and technology. True Star cultivates student’s interest in creating media, all while building skills and proficiencies, and teaching youth the role media plays in addressing societal issues. True Star after school programs have a long history of impacting Chicago’s youth personal development, students in True Star see a significant improvement in their self esteem and how they see themselves in the world. Youth in the True Star programs are exposed to careers, mentors, and networks they would have never experienced without the True Star program. True Star has provided real work opportunities for over 5,000 youth since its inception.